Now, more than ever, I’m proud to be an American. 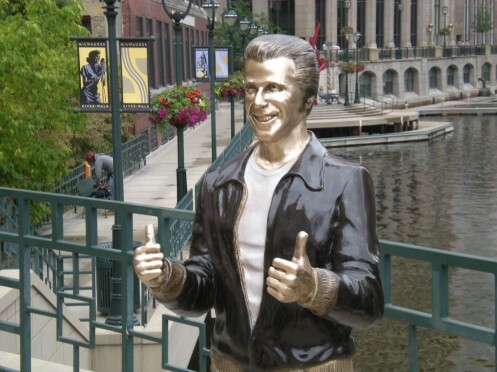 Where else but this great country of ours can you find a bronze statue of The Fonz? Anne’s $3,000 loss on that Daily Double is our gain. That miss notwithstanding, she’s got the lead heading into Final. Remember, we save the dollar changes until the end. If Kurt doubles his score, he’ll have 27,200. To cover this all-in wager, Anne will need to wager 12,400. 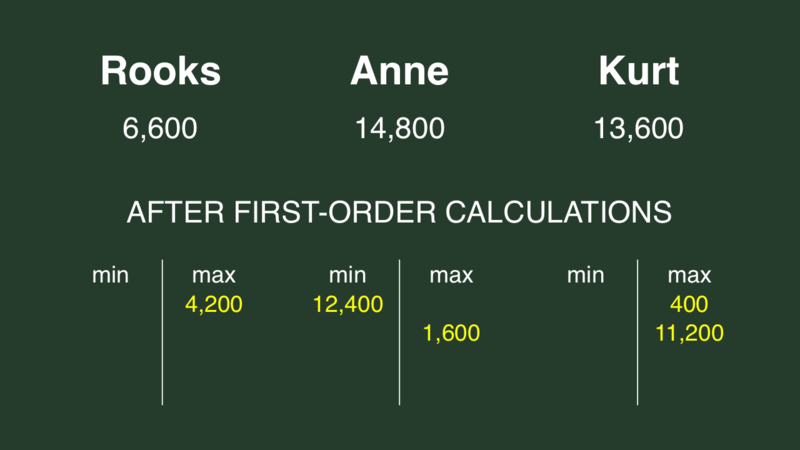 An incorrect response with that wager will leave Anne with 2,400. To stay above her total, Kurt can wager up to 11,200. Rooks can wager up to 4,200. A successful doubling will put Rooks at 13,200. To stay above her, Kurt can wager at most 400. 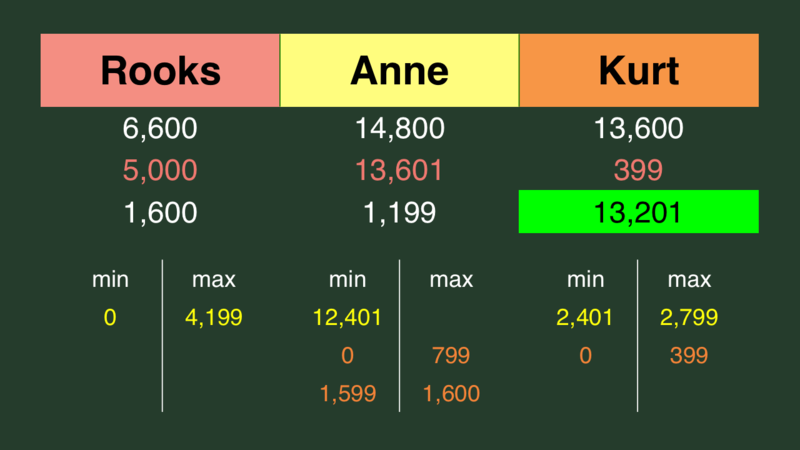 Anne could wager at most 1,600. Technically this is not a Shore’s Conjecture situation, since Kurt can’t cover a zero wager by Anne, but it is similar. If Kurt chooses to stay above a double-up by Rooks, he will have at most 14,000. Kurt will need to wager at least 2,000 to account for this, but he might as well wager 2,400 to cover an “unsafe” wager by Anne. If Rooks aims to stay above Anne’s lockout wager, she’ll have no more than 10,800 with a correct response. That means Kurt should cap his large-ish range at 2,800. Rooks and Anne both go too big; that could have cost either the game, except Kurt was sly. I put that 1,599-1,600 amount for Anne because she has the choice of either if she anticipates Kurt might go for that bigger range. 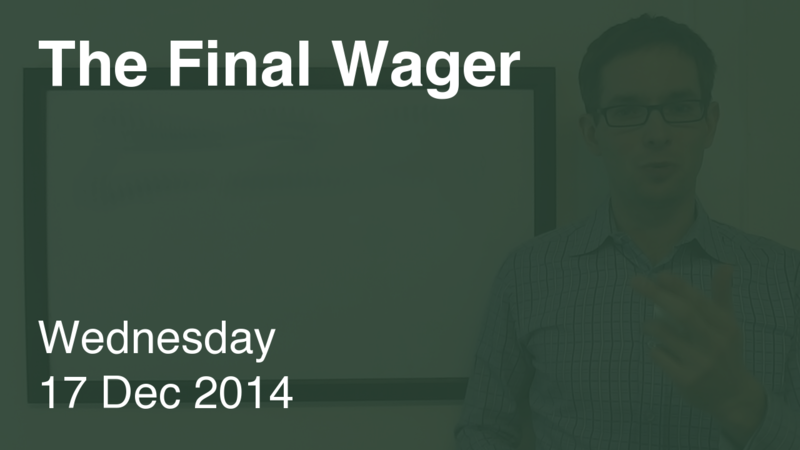 Technically, it’s a weak wager-to-tie situation, which I’ll explain another time. We’re now 18 days without a three-time champion, and 87 without a five-timer. I think it’s time I start a counter or something. What is It’s a Wonderful Life? Anne’s big bet *did* cost her $1,000. I see wagers like Anne’s. I do not get why you try to wager to be a dollar above second’s score. It’s probably for sanity’s sake – it eliminates the worry about a math error.